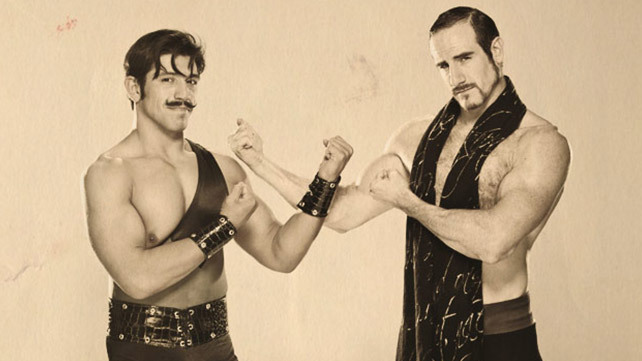 The Vaudevillains are a tag team consisting of wrestlers Aiden English and Simon Gotch. May 23, 2014 – NXT Live Event: The Ascension defeated Aiden English and Simon Gotch. May 24, 2014 – NXT Live Event: Simon Gotch and Aiden English defeated Tye Dillinger and Jason Jordan. June 6-7, 2014 – NXT Live Event: Simon Gotch and Aiden English defeated Tye Dillinger and Jason Jordan. June 20, 2014 – NXT Live Event: Colin Cassidy and Enzo Amore defeated Aiden English and Simon Gotch. June 26, 2014 – NXT: Aiden English and Simon Gotch defeated Matt Sugarman and Tee Perkins. June 27, 2014 – NXT Live Event: NXT tag team champions The Ascension defeated Aiden English and Simon Gotch to retain the titles. June 28, 2014 – NXT Live Event: Aiden English and Simon Gotch defeated Colin Cassidy and Enzo Amore. July 17, 2014 – NXT: Aiden English and Simon Gotch defeated Colin Cassidy and Enzo Amore. July 24, 2014 – NXT: Kalisto and Sin Cara defeated Aiden English and Simon Gotch. July 26, 2014 – NXT Live Event: Aiden English and Simon Gotch defeated Dash Wilder and Scott Dawson. August 1-2, 2014 – NXT: NXT tag team champions The Ascension defeated Aiden English and Simon Gotch to retain the titles. August 7, 2014 – NXT Live Event: Aiden English and Simon Gotch defeated The Ascension. August 9, 2014 – NXT Live Event: Aiden English and Simon Gotch defeated The Ascension. August 14, 2014 – NXT: Aiden English and Simon Gotch defeated Bull Dempsey and Mojo Rawley in the 1st round of the NXT tag team titles tournament. August 21, 2014 – NXT: Aiden English and Simon Gotch defeated Colin Cassidy and Enzo Amore in the semi-finals of the NXT tag team titles tournament. August 29-30, 2014 – NXT Live Event: Aiden English and Simon Gotch defeated Dash Wilder and Scott Dawson. September 4, 2014 – NXT: Kalisto and Sin Cara defeated Aiden English and Simon Gotch to win the tournament and becoming the #1 contenders for the tag team titles. September 20, 2014 – NXT Live Event: The Ascension defeated Aiden English and Simon Gotch. October 2, 2014 – NXT: Aiden English and Simon Gotch defeated Tye Dillinger and Jason Jordan. November 6, 2014 – NXT Live Event: Aiden English and Simon Gotch defeated The Ascension. November 8, 2014 – NXT Live Event: Aiden English and Simon Gotch defeated The Ascension. April 7, 2016 – SmackDown: The Vaudevillains defeated the Lucha Dragons in their WWE SmackDown debut.